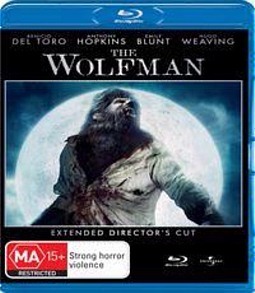 After being beset with delays, including a change of director in pre production, The Wolfman arrived in theatres and had a solid run, if not exactly lighting up the box office. Now here it is on DVD and its box office performance can extend to the film itself. The right ingredients seem to be in place, but the end result is unspectacular. The film centres on Lawrence Talbot (Benecio Del Toro), an actor who is making his living far from home in America. He has gone so far because he is still traumatised from early memories of seeing his mother with her throat cut. While performing in London, he receives a letter from his brothers fiancée Gwen (Emily Blunt), informing him of his death under mysterious circumstances. He returns home to his father (Anthony Hopkins) in order to find out the real reason behind his brothers disappearance. While investigating a gypsy camp, it comes under attack by a savage beast, and Talbot is bitten. Despite being near death from the attack, he recovers in a few days and returns better than ever. After this the attacks start and the body count piles up, as Talbot struggles to come to terms with what he has become. The main problem with the film is that it possesses many dull stretches that seem to stem from awkward shifts in tone. The film contains a love story that is tedious and hard to invest in, father son dramas that suffer the same issues, big action set pieces that suddenly ratchet up the gore, and period drama that once again, suffers from being ultimately uninteresting. They all seem cobbled together as if the filmmakers couldn’t decide which angle they wanted to take on the film so they just decided to try all of them. This results in not enough effort being given to all the films subplots which makes them hard to care about. The set pieces are big, and at times genuinely exciting, but feel like a jarring shift from the ominous horror film it was trying to be. Instead it turns the film into a slasher, and feels out of place. The performances are decent, Del Toro broods through most of the film effectively, and Hopkins plays a rather unhinged man quite well. Emily Blunt doesn’t look like she was given enough to do with the script and Weaving at times, seems to slip back into his Agent Smith persona, just a hundred years or so back in time. The transformation from Talbot to Wolfman is impressive, it is not a smooth transition, and feels physically painful to watch as his limbs snap out of joints. The DVD boasts some deleted scenes, intended to flesh out the story a little more. We get a little more on Singh the servants backstory, and an extended fight sequence between wolves at the end. There is also an extended cut of The Wolfman tearing up London that is quite entertaining to watch. These are the only features included on this edition. The Wolfman was not worth the wait. With all the talent on board including the writing talents of Andrew Kevin Walker (Se7en) and the award winning cast it seems like it should have turned out better. But all the changes and delays during production seem to have crafted a film that does not know what it wants to be, and as a result spreads itself too thin.